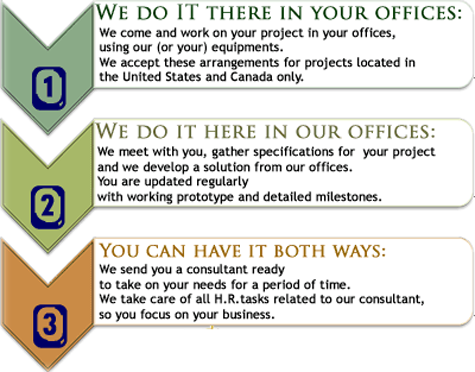 Our Strategy » Pacosoft | Website Design SEO software development Ottawa and Des Moines. Caught in the crossfire of complexity and living with limitations, you have probably come to realize that existing solutions are not sufficient to achieve your vision. Information Technologies are rapidly changing. Financial rules, governmental regulatory compliance and tax laws are becoming more and more complex and subject to continuous changes; A multitude of Enterprise wide software packages and vendors platforms further complicate your choice. You want to increase efficiency by providing access to and sharing vital information across your entire organization, and even extending that access to customers, suppliers and other partners. You desire a speedy and effective recovery in case of disaster or system failure. You want to focus on your core business. You want the ability to react quickly to changing business requirements and compete more effectively. And you want to – you have to – make your vision a reality in a timely manner, before your competitors do! That is where we, the great minds, come in to guide your IT decision making.